Muscovites weary of traffic jams were especially envious of Formula 1 drivers burning rubber in the Russian capital last weekend. On July 15, Muscovites had the chance to listen to the roar of engines and smell the burned rubber of Formula 1 racecars. The two-day Moscow City Racing show featured a demonstration of Ferrari, McLaren and Russian Marussia racing cars. 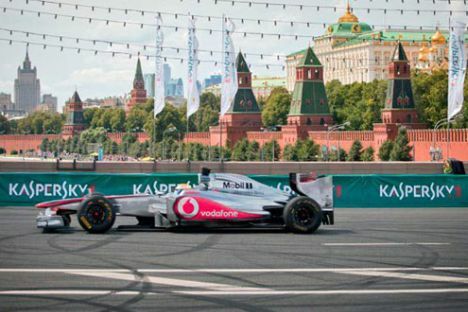 The two-day Moscow City Racing show, one of the most epic racing events to be held in the Russian capital in recent years, took place in the center of Moscow along the Kremlin walls. The show featured Formula-1 racers Giancarlo Fisichella (Scuderia Ferrari), Lewis Hamilton (McLaren) and Charles Pic (Marussia). After professional motorbike racers warmed up the crowd, the Scuderia Ferrari was presented by its test driver, Giancarlo Fisichella. “It is something truly remarkable. Thousands, tens of thousands of people come here to look at the cars and admire piloting. I just love racing. I have taken part in more than 230 Formula 1 races during my 14-year career; I am 39 now. I guess I’ve done enough,” Fisichella said in an interview with Rossiyskaya Gazeta. Charles Pic was the last of the three pilots to show off his driving skills, and it was the first time that the young Marussia F1 team raced in the show. During the first drift session, the Marussia suddenly stalled and Pic had to leave it on the track. The mechanics did not manage to bring the car back to life at once, leading some to speculate that the young racer must have been so thrilled to be part of such a show for the first time ever that he clearly overdid the “donuts” and overheated the engine. The safety system of the car then disabled all the controls. After the show, Hamilton said he had been looking forward to the Moscow exhibition. “I’m happy to visit Moscow and I’m glad that the show attracts so much attention. Vitaly Petrov (Russian F1 pilot) was telling me that Russia was interested in Formula 1, and I see now that it is true,” the racer said.